– ¿Es legal compartir coche? No, por Rodrigo Caballero. – ¿Es legal compartir coche? Sí, por David González. 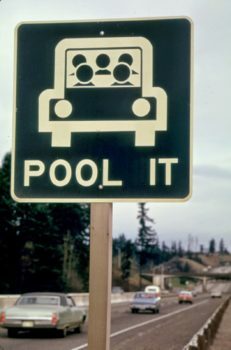 Imagen:”“Pool It” Sign North of Vancouver, Washington, Was a Reminder That the Gasoline Shortage Was Not over in March, 1974 and Sharing Rides Was a Good Idea 03-1974” by David Falconer. Licensed under Public domain via Wikimedia Commons.